They Sent Me To This Meeting – Hi Blog! I'm Dad. During his yearly assessment a few weeks ago, it was suggested that I attend an informational meeting for my son, Lucas. While he is non-verbal with Autism, this particular gathering was to help explain the process for all people with developmental disabilities to get proper services. The idea is to make their lives, and the lives of those around them, easier. It was just yesterday at a local school I’ve only been to once or twice. I wandered into the general purpose room fifteen minutes early and made sure to take a table all the way in the back. As is usually the case with meetings like this, I had my serious Dad face on and made every effort to hide any emotion. I didn’t want to talk. I didn’t want to share. I didn’t want to sing Kumbaya. My goal was to get in, get info, and get out. Hey, hey. Is this the cool table over here? Are we at the cool table? Ugh. I mumbled something back about “that’s what they tell me” or “now that you’re here” or some other half-hearted display of wit. In reality, I had no desire to make friends with him or anyone else. I just wanted to make it through this thing in order to help my son – which is a sentence I’ve said a lot in the past eight years. Luckily, I have that stoic Dad face and, to be honest, meetings like this don’t have to be a cause for tears. Still, that doesn’t mean it was an easy presentation to endure. Almost immediately, I was reminded of how these seemingly innocuous information sessions could slam you across the face with reality. It was within the first five minutes when Ken, the speaker, listed the second reason a child could qualify for this service. Their disability should be permanent and life-long. Ouch. While this might be something that I know, understand, and accept, that’s not the easiest thing to hear said out loud. Parents are used to people offering a hopeful “anything can happen”. We pat ourselves on the back and talk about upcoming miracles. It’s rare that you hear the word “permanent”. My imagination ran away from me. Of course, none of that happened anywhere outside of my head. It made me smile at the exact moment I needed it most though. As the meeting went on, there were more instances of not-so-pleasant future scenarios being openly discussed in ways that could make any parent, no matter how optimistic, take pause. It can be like having a band-aid ripped off…and then jabbed at with a splintered toothpick for about two hours. It’s easy for me to feel like the odd-person out during meetings like this. There was the moment when the co-speaker, Janice, made a joke about how this process should be “smooth like creamy peanut butter” but sometimes is “like chunky peanut butter, ripping up the bread.” Half of the place erupted in laughter. It was as if they never heard a joke before. I wasn’t sure if that other father at my table laughed because I had made a concerted effort to avoid any and all eye contact with him the whole time. That’s where I was at this point. It’s very important that we see how any disabilities affect your child. 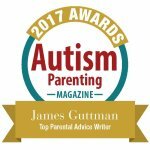 We need documentation that explains that and not simply a letter from your doctor that says he or she has Autism or another particular diagnosis. OK? Yes? You have a question? Yes. I have a letter from my doctor saying my son has Autism. Do I send that? Ken, obviously used to this, didn’t miss a beat. No. Unfortunately, we need to know how that affects the individual. So, something more specific about what areas you might require services for. OK? Yes? You have another question? I do. So, I can call the school for these documents? They probably have it. I think it’s a letter from my doctor that says he has Autism. Does it specifically say how it affects him? It says he has Autism. It’s a letter from my doctor that says he has Autism. Oh, see. No. I’m sorry. That wouldn’t be enough. Oh, so I should just call my doctor directly then. …and have him write a letter saying my child has Autism? This went on and on. It wasn’t just that one mother either. It was multiple mothers. I watched the clock tick away and tried not to stand up, flip the table, and scream, “He said no! He needs a list! Ask him after!” Again, the reaction from Cool Table Dad would have made it worth it. Let me just be clear here. I know I’m the grumpy one in all of these scenarios. I freely admit that. I may be climbing the walls inside my head, but you’d never be able to tell from my outward demeanor. That’s pretty much what being an adult is all about. In the end, I’m proud to say, no tables were flipped. Instead, I properly sat through the entire two hours. Upon leaving, I took a deep breath and congratulated myself for taking another step forward for my boy. I didn’t cry when I got to the car, either. I wouldn’t fault any parent who would, though. We all want what’s best for our kids. Being presented with a lengthy list of areas to work on and requirements to fulfill can be overwhelming for anyone. I love my son more than any boy in the world, which is why meetings like these are tough. You can walk in feeling completely clueless and leave feeling even more clueless than you went in. Eventually, though, you make it work. I know I do. What else am I going to do? He’s my kid. I owe him at least this much. On the day he was born, I promised my son that I would move Heaven and Earth for him. If I swore I would fight dragons and topple mountains in his name, then I know I can handle meetings like this.